Marvelous Multiagers! : Looooove Monsters and a Freebie!! How was your Monday? Mine was great, considering it was a Monday. My class is really excited about Valentine's Day but they weren't being too overly crazy today so hooray for that! Today we prepped our Valentine holders for tomorrow. I got this idea (and the templates) from Amber at Adventures of a Third Grade Teacher. I just found her through Chrissy's linky party and I was instantly loving the love monsters. My class died of happiness when I showed them my sample. She spent a lot of time on hers! It had hair and also nail polish, which you can't see in this picture. Last week, we made hearts for our wire thing! I got the template from Mrs. Bainbridge. They loved these even though no one understood how to weave them and basically one of the second graders and I did everyone's hearts for them. Whatev. Tomorrow I have a pretty fun day planned, I think. 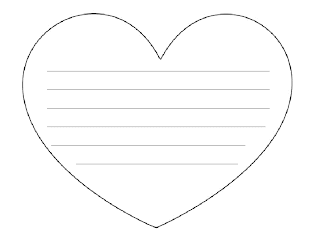 For writing, we have been working on 5-sentence paragraphs, so today we started working on a Valentine which will incorporate paragraph writing! They had to write it to someone in their family about why they were the best sister ever, or brother, or mom, whatever. They needed a topic sentence, three body sentences, and a closing sentence. We wrote our sloppy copies today and I was so very proud of them! A few friends think that "bald and cool" is a sentence, so we're not quiiiiiiiiiiiiiiite there yet, but I'd say 80% of them can easily write a 5-sentence paragraph with no prompting from me! I'll show you the finished product tomorrow, but for now, I want to share a little freebie for ya. For this writing project tomorrow, I needed heart writing paper and I couldn't find anything that I liked. So I made my own. It is nothing special but the lines are big enough that my kids can write on them and can fit their whole paragraph on there! Just click on the little preview to go there! I'd be super happy if you left me a comment if you're able to use it! I am excited for Valentine's Day tomorrow! Are you? We get a non-uniform day so that makes the day 100% more awesome. Yay! I love that you could use my templates! Your kid's love monsters turned out soooo cute! Those monsters are adorable!! Happy Valentine's Day! Those are very cute monsters. CUTE CUTE CUTE Love Monsters! Whenever we do weaving, one expert pretty much does everyone else's so I understand. Whatevs is right!! I'm sorry the woven heart was so challenging! ;) I'm glad you were able to use it though... and that you now know that one of your kiddos has good spatial relations!